"Saline Solution" was an idea I had about eight years ago - put the driver under the engine bubble in the Cherry Bomb and plant some big mill in the rear to make a wild showrod/salt flat screamer. I figured the upside-down wing shape and shallow aero tunnel underneath would provide enough downforce to counteract the top-heavy engine placement. The rear wheels were tucked inside the bodywork after I'd removed the fenders. 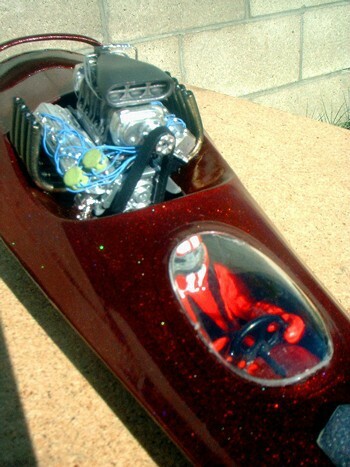 The original cockpit area that wasn't going to be filled with engine was covered with a section of friction-shaped Evergreen sheet before the whole assembly was coated in gold pearl, then covered with red candy and rainbow holographic flake. 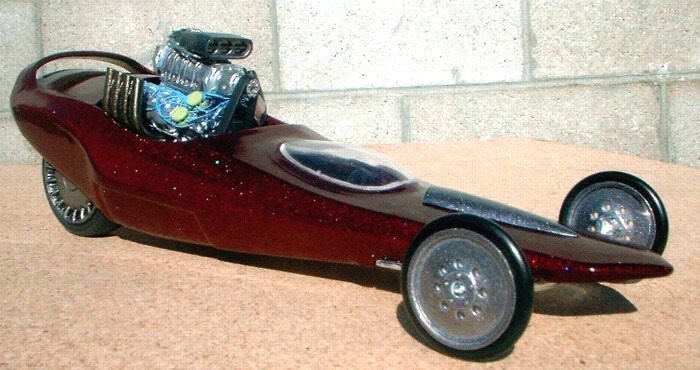 A top fuel kit gave up its Blown Hemi and front wheels which were coated in several different metallics and pearls to represent all the raw metals and hi-tech coatings on today's nitro motors. Rear wheels from a Chrysler Atlantic were stripped of chrome, dry brushed with Testors Jet Exhaust, then wrapped with slick tires from a Tamiya motorized racer. The driver showed up one day when I won an Indy car kit at a club raffle. All together, it took me a long time to get around to finishing it, but this 2003 Bubbletop Challenge was the push I needed to make this project a priority.